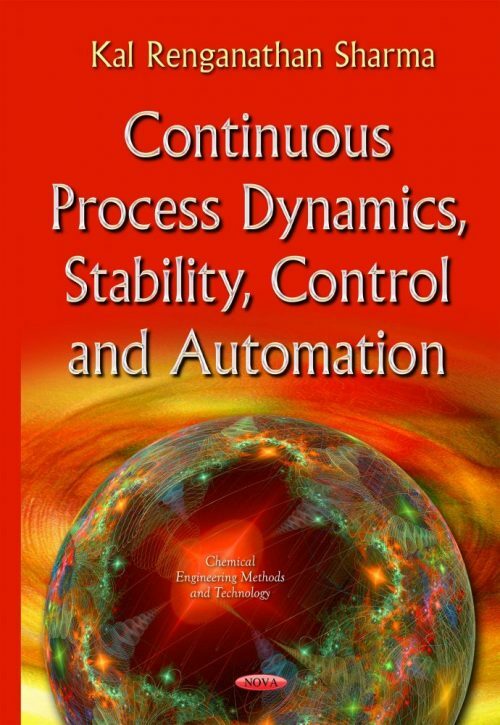 This is a modern first course on process control, instruments, process dynamics and stability. MS Excel spreadsheets are used in order to obtain solutions to non-linear equations when needed and closed form analytical solutions are obtained using Laplace transforms and other methods. The solutions are presented in 210 figures and the book has 1319 equations. With an industrial controls market size of about 150 billion dollars and a chemical process industry market size of three trillion dollars, the practioners can use this book to master techniques of P, proportional, PI, Proportional Integral, PD, Proportional Derivative feedback control, feedforword control, hybrid control, adaptive control, internal model control, ratio control, filtered real proportional integral derivative control, ANNs, artificial neural networks, SPC, and statistical process control. Control block diagrams are developed using MS Paint. Flavor for what is a continuous process is given using 18 process flow diagrams. Be it a feedback control of temperature in a mixing tank or a neural network design for a distillation column, the details and the big picture are both given. Pioneers who made this area possible include people such as Maxwell, Galileo, Sherwood, Levenspiel, Kalman, Laplace, Fermat, Damkholer, Newton, Fourier, Fick, Michaelis, Menten, Monod, Staudinger, Ziegler, Natta, Flory, Peclect, Bode, Nyquist, Biot, Bessel, Bernoulli (both father and son!) , Euler, Stokes, Mach, Reynolds, Prandtl, Nusselt, Weiner, Hopf, Clapeyron, Clausius, Lorenz, and Kreb, who are mentioned where their theories were used in the analysis. AIChE, American Institute of Chemical Engineers, New York, NY recently celebrated their centennial or 100th anniversary in 2008. Both the chemical process industry and the industrial controls market size are increasing. Process Control as a required course in the chemical engineering degree plan in a number of US universities came out in the late 60s or 70s. I instruct CHEG 4033 Process Dynamics and Control, MCEG 3073 Automatic Controls and MCEG 3193 Introduction to Robotics, CHEG 3043 Equilibrium Staged Separations, ELMT 2043 Industrial Electronics etc. I have served as the chairman of Continuous Mass Club: Technical Community of Monstanto Minichapter between 1990-1993. This book is a natural outgrowth of these scholarly and research activities. A modern textbook is proposed that keeps pace with the progress in personal computing resources available to the student these days. Emphasis is placed on industrial application over rosy predictions. For instance, ideal PID control, proportional integral derivative control is not physically realizable. The competition of this book has a entire chapter devoted to PID control. Filters have to be added and then it is longer PID, it becomes FPID, filtered PID control! Discussions on overshoot is in excess of its occurrence in real applications. A careful scrutiny of overshoot can lead to the conclusion that it is more a mathematical artifact and less a engineering possibility It can be shown that overshoot per se violates second law of thermodynamics.. This book is more focused on the applications rather than on tuning and elloborate algebra. Calculus, Laplace transforms and other mathematical methods are used when necessary. A entire chapter is devoted to pharmacokinetic studies. Discussions on life systems draws the student attention more than hypothetical mathematical exercises. A entire chapter is devoted to control of robots. Advances made in nanorobots are also discussed in a separate chapter. Separate Chapters are devoted to mathematical models and process dynamics.